Flat Earth Kayak Sails Tradewind 0.8 preview. A very exciting parcel arrived from Australia this week. It contained the Flat Earth Kayak Sails new Trade Wind 80 sail in Grand Prix cloth. The Trade Wind line will gradually replace the current Code Zero line. I was in Kari-tek, the European distributor and mast/fitting kit supplier, about two weeks ago. Geoff told me that he had just taken a delivery of 50 Code Zero sails but had sold them all already! Apparently P&H had taken delivery of a further 40 sails and Geoff had to supply masts for them very quickly, so he reckons they have all sold too. 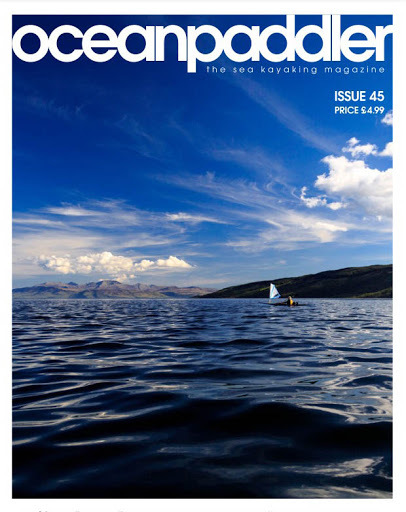 ...the front cover of the forthcoming issue of Ocean Paddler very clearly shows! Anyway back to the sail. the Trade Wind 80 is 0.8sqm in area, which is the most popular size as it has the widest wind range. It has a slightly shorter luff and has more sail area in the roach (top) than previous generations of the FEKS. The Grand Prix material is a mylar/scrim/mylar trilaminate. The scrim is made up of carbon and kevlar yarns so it is very resistant to stretching or tearing. This type of trilaminate material is very tough and resistant to UV (not a particular problem in Scotland though I did develop a melonoma!) This type of cloth has been long used on windsurfer wave sails and they take a real thrashing. The previous Code Zero cloth is great when new. It is a thin mylar/dacron bilaminate but it tends to soften with repeat folding and this may be why the leach of some older Code Zero sails "motors" in stronger winds. I suspect this will not be an issue with the Grand Prix cloth. It is partially see through. There is no window option but recent Code Zero 0.8 and all P&H branded Code Zero sails had dropped the window anyway. If you use the standard mast, the window only gave a view of the sky anyway. ...moved up to the roach of the sail. This shows the new Trade Wind red beneath the previous Code Zero blue. The sail has less twist than previous generations of flat Earth sails particularly the original all dacron ones. This shows the sail in the run position in a F4 breeze. The boom needs to be kept sheeted in a bit to prevent the roach of the sail moving forward of the mast and spilling wind. But when a gust hits this twist increases and spills wind. The previous generations of the FEKS needed the boom sheeted in more. The new sail is therefore a bit more unforgiving than the original sails but will retain more power before auto spilling the wind. This is the Trade Wind 80 sheeted in a close reach position. The sail has been expertly cut with almost no trace of a wrinkle. 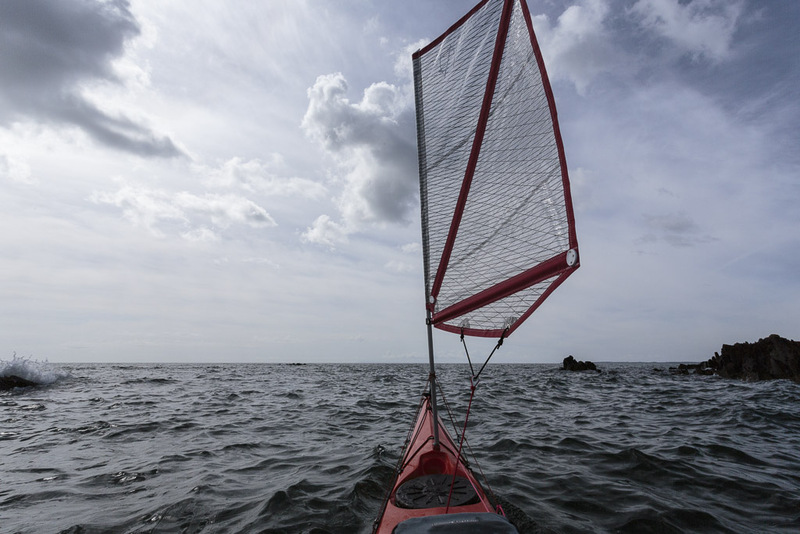 I think the fullness of the sail looks a litter further back than the previous Code Zero which will make it a little more powerful for its size especially on a broad reach. As you can see the boom sits higher on the standard mast. You could cut the mast top down and lower the sail but I am not going to do that. I like the sail up higher as the wind gets slower and more turbulent the closer down it is to the surface of the sea. I want the sail to catch the clear stronger air higher up. I wasted no time in getting it out onto the water on my P&H Delphin. 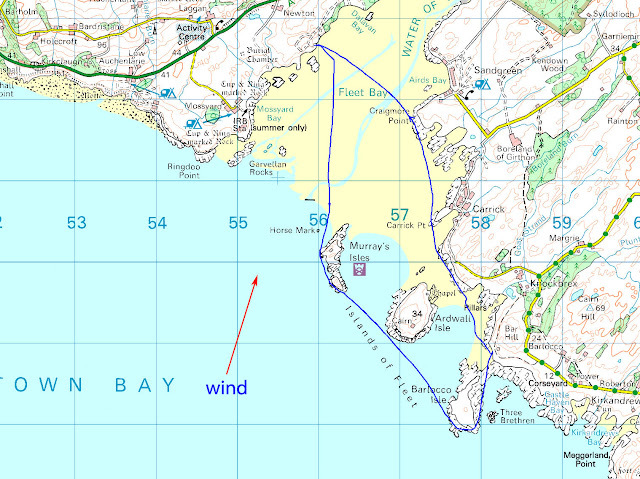 The wind was very gusty offshore in a sheltered bay from F2 to the bottom of F5. The sea was flat. The sail having lest twist is a little less forgiving when you launch on a broad reach than the original all dacron version. Code Zero users will probably not notice much difference. It goes up with a satisfying wumph! The gusty winds were a good test for me (a relatively experienced paddle sailor) to see how a newcomer might find the sail in steadier conditions. Well it was no trouble at all. 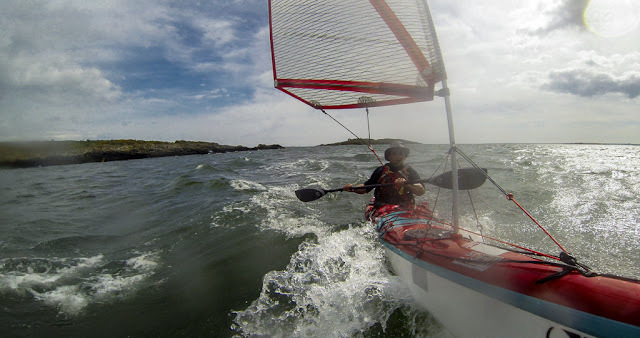 I liked everything about it, tacking upwind, on a reach running and gybing. There were no scary moments even in the most sudden gusts. Even in the strongest gusts there was not a hint of the leech "motoring". I was on my own so it was not possible to do a side by side comparison with the previous Code Zero sail. However, I did like what Mick has called the "slightly more aggressive" nature of the sail. I felt more of the gust was being transformed into forward drive rather than spilling out off the roach as the sail twisted. This is steady evolution, it certainly won't make your Code Zero sail redundant. However, if you have one of the original all dacron (or dacron with mylar reinforcement on the leech) Flat Earth sails you will notice a difference. This day had a steadier wind though it was still offshore. It was about F3 inside the islands and F4 outside the islands. I decided to go round the Isles of Fleet which would test the sail on a number of sailing angles. 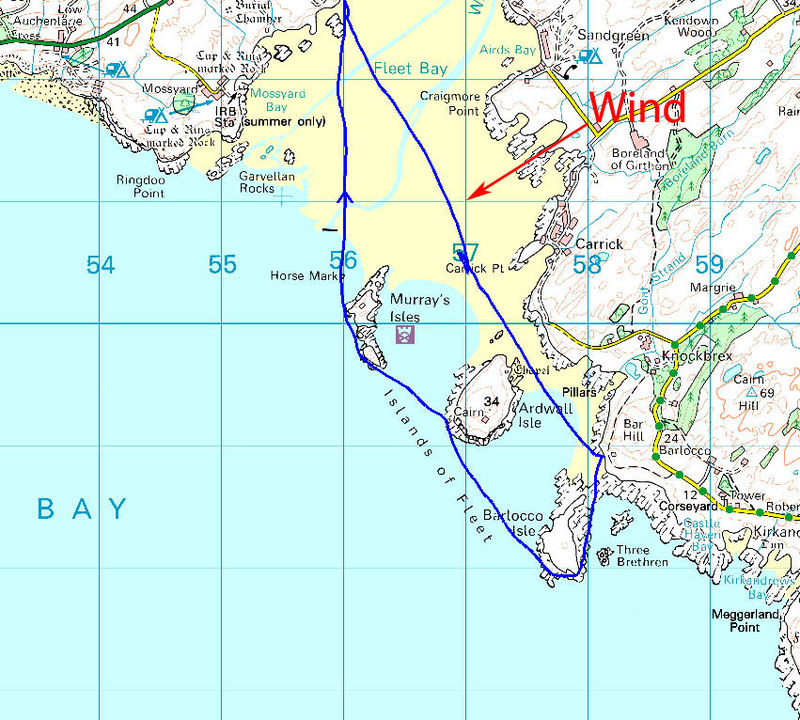 One thing to note here is that I had the sail up and pulling for the whole of this route despite my course being closer to the wind than a beam reach in several places. Who says you cannot paddle sail upwind? It was a nice beam reach out and I was able to study the cut of the sail. I am sure that the deepest part of the draught of the sail has moved a bit further back. The head is also flatter than previous generations of the sail. 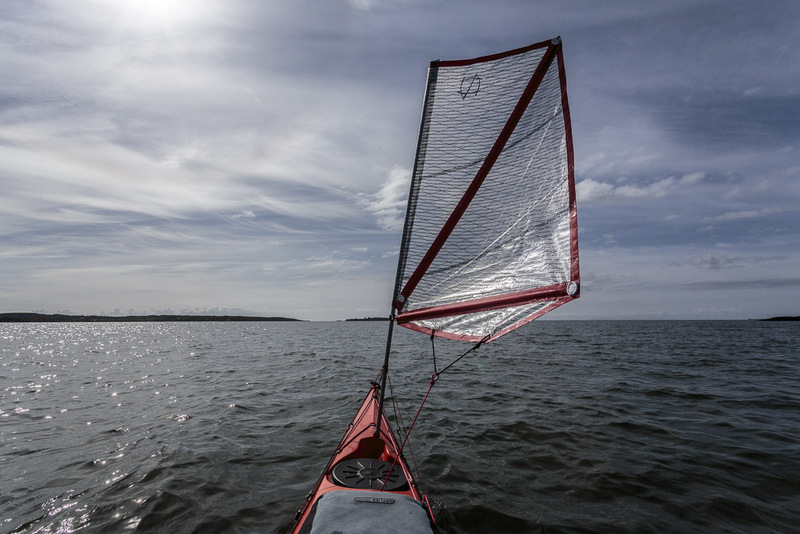 As a windsurfer I have always liked using sails with a deep belly a flat head and a roach that twists off in gusts for their wide, controllable wind range. As a sea kayaker I like this style even more. I think Mick has really nailed it with this particular cut! I met a head wind through the narrow channel which separates Barlocco Isle from the mainland and had to sheet in to a beat. This Grand Prix sail material is stiffer than the original dacron material and it is a little more difficult to judge how high to the wind you can paddle sail without luffing the sail. The softer dacron sails definitely showed the leading edge backwind at an earlier stage. 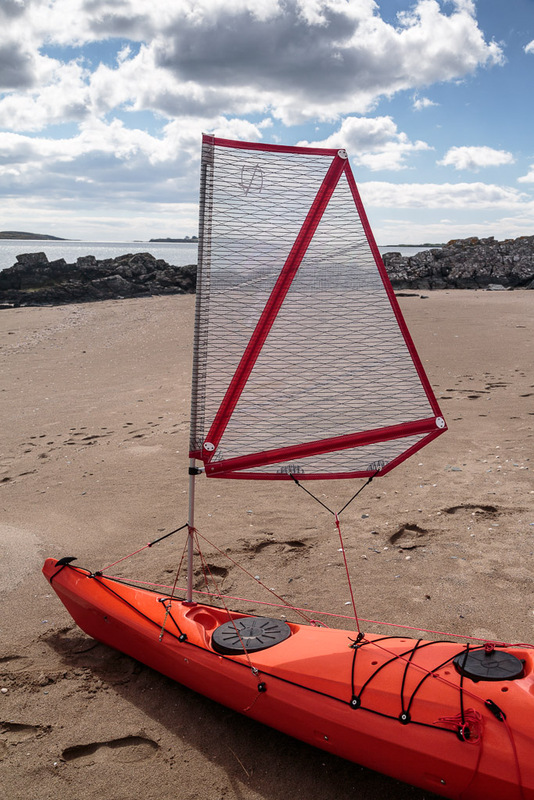 I was not bothered by this but if beginners are particularly concerned about beating performance (rather than just blasting about having fun) they could thread a wool tell tale through the luff of the sail about half way up and in front of the batten. The tell tale should be horizontal sailing close as possible to the wind but if you point too high into the wind it will start to move up. On the way home it was a close reach into the increasingly gusty bay. Even the worst of cat's paws at the head of the bay did not unsettle the sail, the boat or myself. 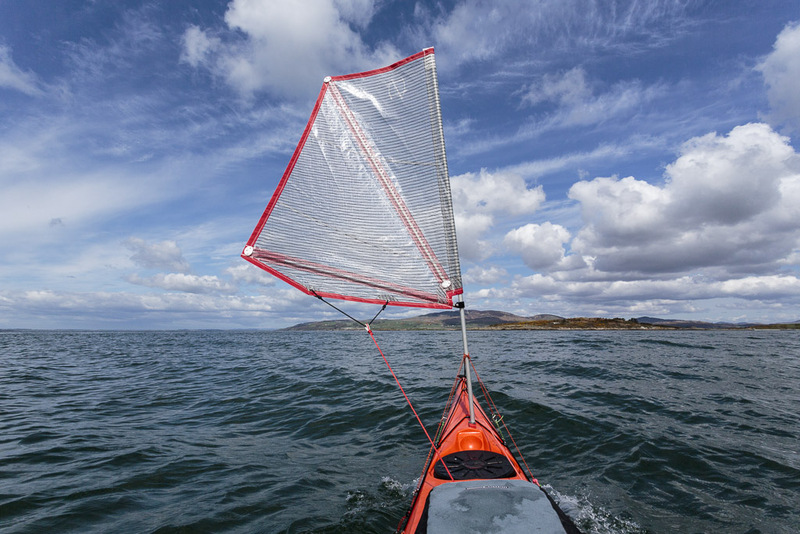 On my third day out with the Trade Wind 80 kayak sail I got the chance to try it out on rougher water. The wind was F4-F5 onshore against a big spring ebb tide. 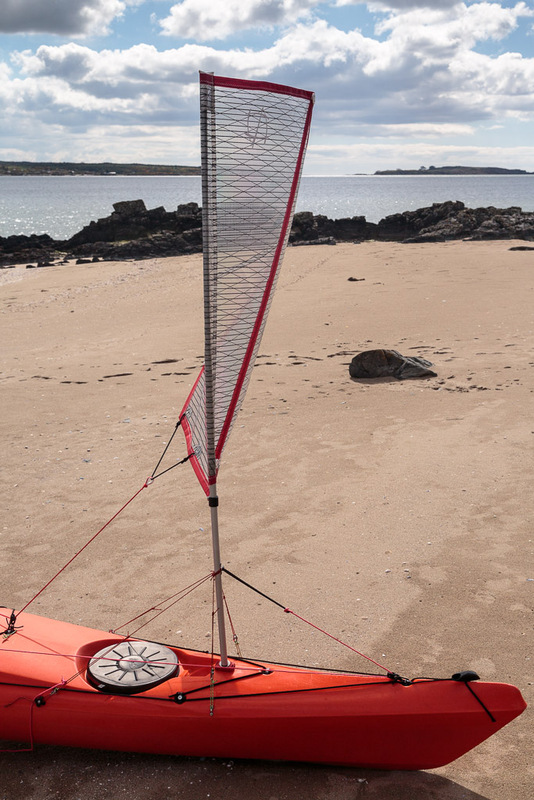 I like the way the sail is full low down and gradually flattens off as you move up to the head, The head does not twist off so much as the old dacron sails when a gust hits going upwind but this does not result any any feeling of instability. As I tried to sail as close to the wind as possible on the way out I noticed that the stiff Grand Prix material definitely made it more difficult to see how close to sail to the wind as the luff did not back wind as easily as the lighter cloth in the current Code Zero 80 sail. 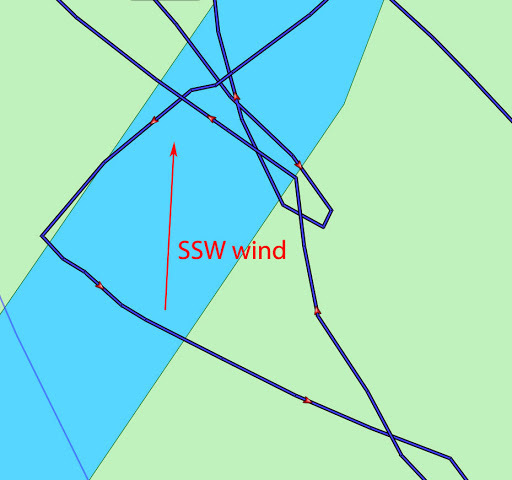 However, this did not seem to have much effect on upwind performance as you can see by the tacking angle of the tack on the left of this GPS track. The kayak was a relatively short P&H Delphin 155 with no forward fin. I thought the upwind performance was pretty remarkable. I do like the fact that the area of the sail now sits a bit higher than the current sail. In waves the air flow is very disturbed as it approaches the surface so the new sail is meeting cleaner air. 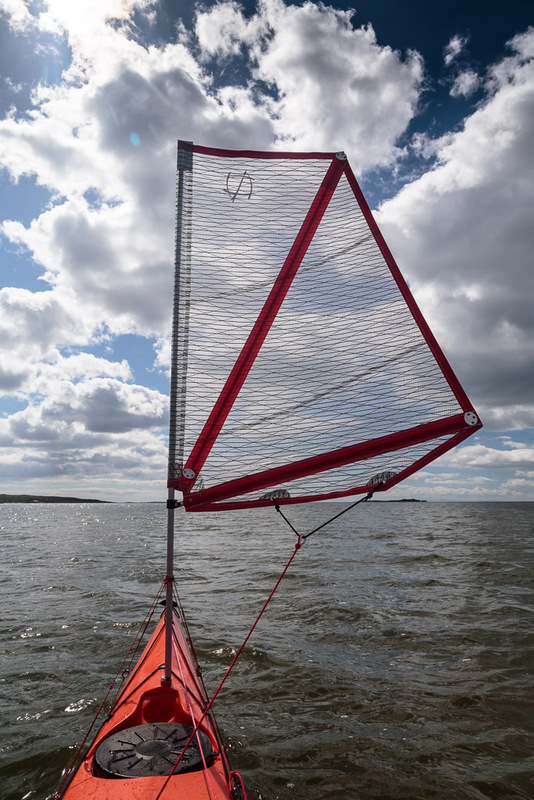 One thing /I did notice about the new sail is I find it easier to control in stronger winds as it feels much more stable than the previous dacron versions of the sail. The dacron sails distort more and the centre of effort is not so stable and moves about the sail. So although they may be softer and more forgiving you never really know where you are with them. I think the Trade Wind sail's very solid feel is due to its centre of effort being much more static. Basically I like the feel of Trade Wind a very great deal when going upwind. Now the fun started. It was a blast going downwind. Note that the well powered up sail has not a hint of a wrinkle (you might see a wrinkle or two in lighter winds). ...climb over it and chase the next wave in front. The GPS showed my maximum speed hit 22.9km/hr and I was frequently hitting over 20km/hr when on the plane. Again the cut and heavier cloth give the Trade Wind 80 sail a very stable feel downwind. When you drop off the plane you slow down and the apparent wind increases. In the old dacron sails the leech would suddenly twist off spilling wind but moving the centre of effort and making the sail feel quite unstable. This sail continues to pull hard when you decelerate but in now way does this feel unstable. Again I really like the feel of the Trade Wind 80 when paddle sailing downwind. My one reservation for someone upgrading from a dacron sail is that undoubtedly the stays will be transmitting more force to the hull, especially if you are loaded with expedition gear. You may wish to reconsider your existing stay anchors. This is my new Cetus MV, note that I have two side stays and two back stays. All four stay anchors are bolted through the kayak's seam, which is one of the strongest parts. At last, a decent breeze. At sea level, my hand held anemometer was averaging 16 knots but gusting to 21 knots so this was a good F4 gusting into F5. 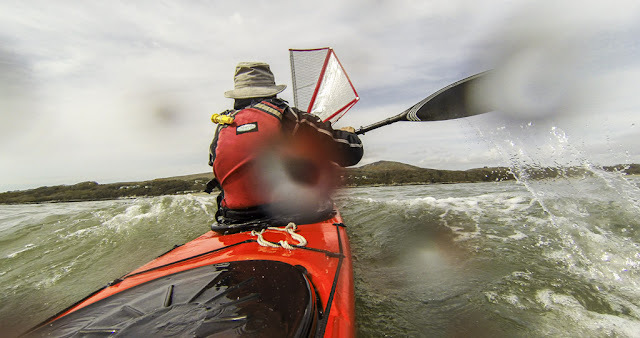 I first paddled into the wind to Murray's Isles once there I then had a beat/close reach to get round Barlocco Isle. I used the forward fin on the Aries 155 on this leg. Then there was a run to the beach below Bar Hill where I stopped to wait for the ebb tide to build up. 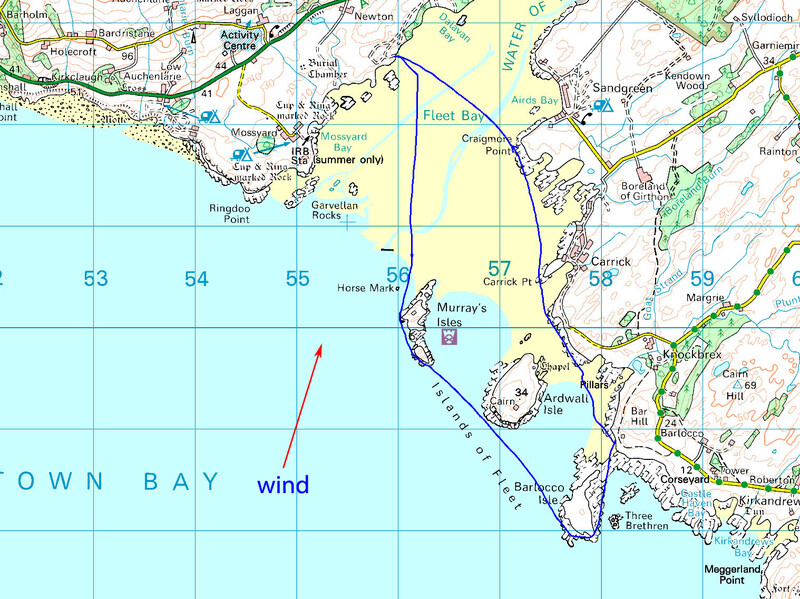 As the ebb increased so did the wind against tide waves and you can see where I bore off between Barlocco and Ardwall Isles to catch some particularly good sets. Conditions off both Carrick point and Craigmore Point were excellent on a broad reach due to the increased tide round the points. Then I was onto a beam reach back to start. The Tradewind 80 holds its shape really well in the gusts. The whole sail is much stiffer than previous generations of the sail. It still exhausts wind from the roach of the sail in the worst of gusts but it does so in a more controlled manner that the older sails, which would suddenly spill wind and the centre of effort would move, making you feel very wobbly. The defining characteristic of the Trade Wind 80 is a very stable centre of effort. This makes paddle sailing at the top of your ability a joy! Despite the lively conditions the sail felt absolutely rock solid. I never felt the remotest inclination to spill wind or take it down. I had several long planing runs when my speed hit 20km/hr and when I was not not quite planing I was doing 10km/hr. Considering this was against the out going tide of about 4km/hr, these were most satisfactory speeds. If I had taken the sail down I am sure I would have found the conditions somewhat uncomfortable. 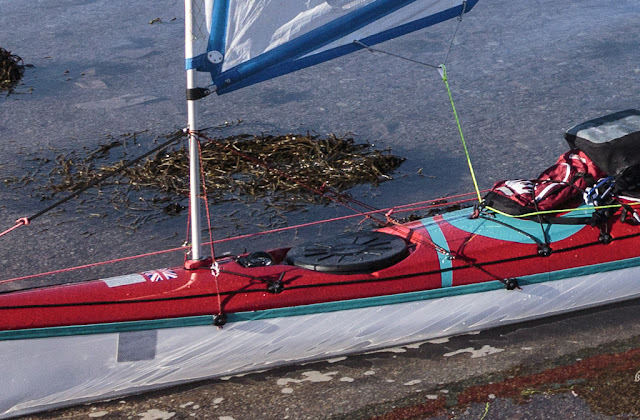 I cannot think of a better expedition sail for paddle sailing in all weathers, summer and winter. 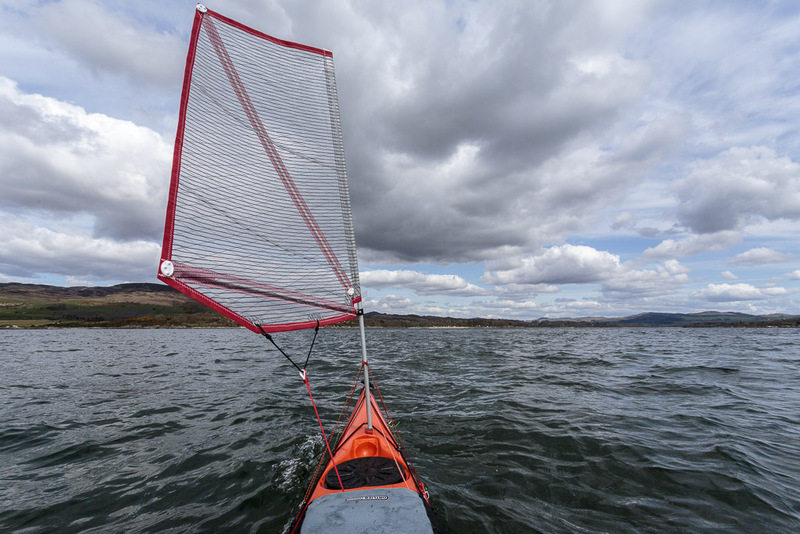 If you are new to paddle sailing do not be put off by its high tech appearance, it is actually very easy to handle. If you enjoy paddle sailing with one of the earlier dacron FEKS then this would make a significant and noticeable upgrade. You could always sell your old dacron sail to a newcomer to paddle sailing who might not yet be ready to invest in a new sail. If you have a Code Zero or P&H FEKS, the incremental improvement is probably not worth an upgrade at this time, unless you just MUST have all the latest kit! In Europe, the FEKS should be available from Kari-Tek by Mid May. Price in the first batch will be the same as the outgoing Code Zero £198 (exc. mast and fittings) then subsequent deliveries will be £218. 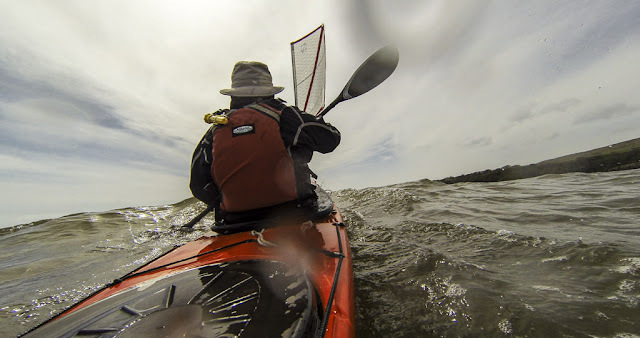 If you are in the Southern Hemisphere keep an eye on the Expedition Kayaks web site as they are one of the main distributors in the sails' native Australia. Disclaimer, this is a free loan sail that remains the property of Flat Earth Sails, the only cost was the postage from Australia. 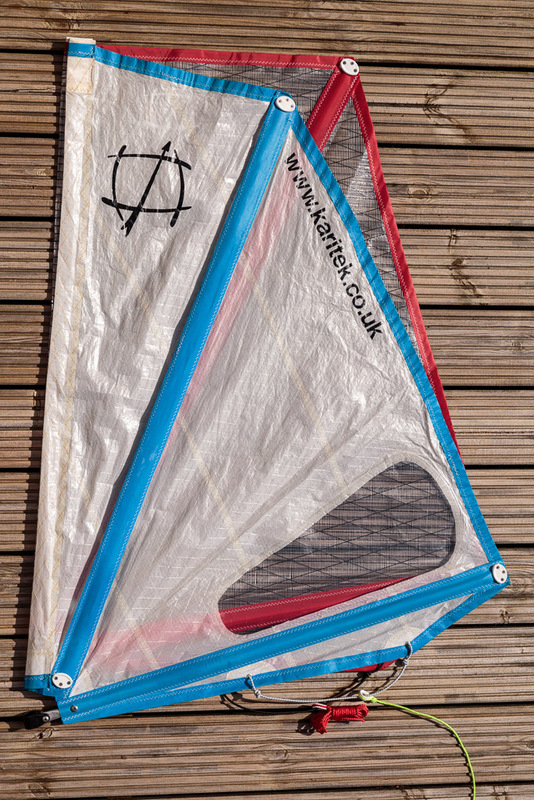 I have however, bought three other FEKS sails at full price. I have no financial interest in FEKS. Although I have never met Mick in person, I consider him a friend. Brackenber Cottage Saving my pennies. Im staggered that so many have been sold - Ive still yet to see anyone else on the water with one but everyone that sees ours wants one! Douglas Wilcox Have begun to see more on the water. Most of the group we paddle with have them, I have now fitted nearly thirty for various people. Brackenber Cottage I need to get out more then!! David Barratt I've been hoping to buy one of these. Never sailed though. Is it easy enough to figure it out? Douglas Wilcox Most of our group who have sails were neither sailors or windsurfers and were completely new to any form of sailing, all picked it up on the first day and all are now addicts! David Barratt Well I think I'll be buying it then!hope it's easy enough to mount! David Barratt But now I need to work out whether to go for the 70, 80, or 100... thoughts? David Barratt Well that's a fairly decisive piece of wisdom! David Barratt It's all in the basket now. Maybe I should sleep on it before taking out the second mortgage to complete the checkout! David Barratt I guess it's comparable to good waterproof jacket. Paul Edmondson It is worth it. We have had ours now for over 2 years, and have kayaked and sailed miles around Scotland, the Lake District and the Solway coast line. They have 'saved' us on at They have 'saved' us on at least 2 occasions, and made difficult journeys possible on others. Well worth the investment. We have sailed around Bute, crossed to Eigg and Arran, sailed around Walney and crossed Morecambe Bay - all with Flat Earth Sails. Brilliant experiences. Buy it!! Wayne Busby 80. I fitted a Code Zero to my Delphin, along with a rudder retrofit. It turns paddling down-wind with a following sea into a whole new experience...great fun! The best bit is that both rudder and sail are removable, making the boat multi-functional depending on weather , conditions and what I want to do . Total cost at the time, about £300 and I fitted it all myself. Gerris Lacustris I was very skeptical about kayak sailing but at a recent canoe sailing meet a friend brought a kayak which had a FE sail already fitted - although he had never tried it. After working out that I needed to set the sail and leave it, rather than keep playing the sheet as I would in a sailing boat, I was well away. Sailing was OK but paddle sailing was amazing, even upwind! I could really see myself using one. The new version looks great and I think that one will soon be flying from my foredeck. Paul Edmondson I have sailed with and without a rudder. The rudder in my opinion, certainly makes it easier to control, especially in stronger winds. Douglas Wilcox Gosh Paul I am not sure why but I have found the complete opposite to your own experience. I find in stronger winds and rougher water that except for down wind, control with the rudder is less effective than with a skeg for all round paddle sailing. Going upwind, I find the lee cocking with the rudder down gets worse as the wind increases. In this photo we are close reaching in a F4/5. I am in a Taran 16 with rudder down and Phil is in a Quest with a skeg a little way down. I just could not keep up because of strong lee cocking (the Taran 16 is generally much faster than the Quest especially downwind). The only way I could stop the leecocking was to lift the rudder and correct my course with paddle strokes and edging which was more tiring than Phil who was paddling straight with just a touch of skeg. A friend who bought and paddle sails a Taran 16 has retrofitted a skeg and he uses the rudder downwind and the skeg from broad/beam reaching round to beating. The Cetus with a rudder lee cocked more badly than the Taran, so it is not just an issue with the Taran. On the Solway (on a mixed sheltered/exposed route round the Islands of Fleet which required all points of sailing) we sailed two Cetuses back to back for a week, one with a rudder only, one with a skeg only. Each sail was mounted in the same position. Regardless who paddle sailed it, the skeg boat always pulled ahead upwind and was first round the islands, whenever the wind was F3/4 or above. Whatever, paddle sailing is a whole heap of fun whether you have a skeg or a rudder. 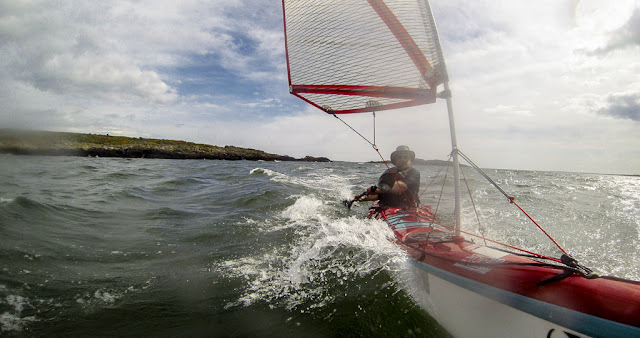 My friend Tony learned (and mastered) paddle sailing in an Alaw Bach without a skeg or a rudder! Paul Edmondson May be its a confidence thing. We"ve been caught out a number of times with wind picking up to force 5+. On one occasion we had to raft up and sail in F6/7. Too strong for the sailS - bending the mast slightly. The rudder ensuredwe were able to concentrate on the sailing and not the direction! 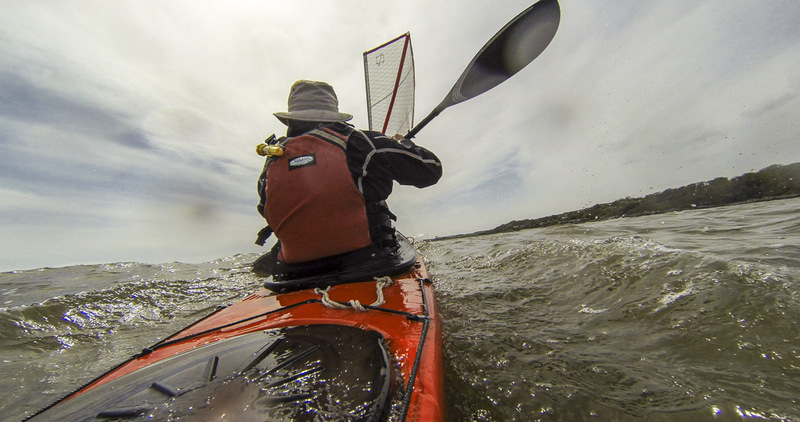 This also happened recently while crossing from Wee Cumbrai to the mainland and last year when kayaking / sailing round Walney. Steering the kayak was so much easier on each occasion with a rudder. Paul Edmondson we now have caribiners permanently on our kayaks to enable us to raft up if the weather takes a turn for the worse. Sailing with 2 sails then is a great experience - exhilaratingto say the least. 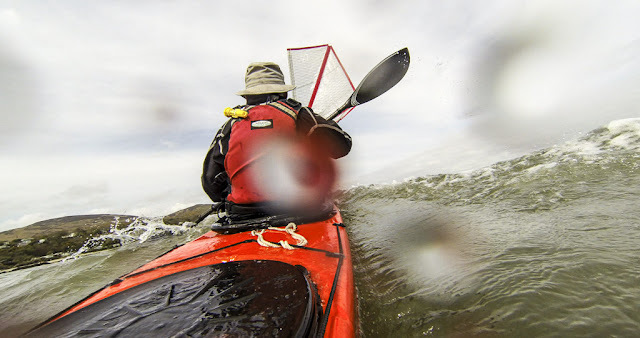 Kour kayaks are Eddyline Fathoms. We have fitted both rudder and sails. Previously had perception essence kayaks. Paul Edmondson we have had flat earth sails for 3 years, initially sailing in the Lake District and then on the Solway, crossing morecambe bay and numerous times at Walney, around Scotland's west coast , including Bute, Arran, Eigg, Loch Long, Loch Shiel and Arisaig.I still think rudders and having the option of rafting up are essential From a safety point of view. Douglas Wilcox Hi Paul keeping the sails up when rafted up is not a good idea. The masts are not designed for that load and you risk bending a mast or worse, breaking your deck. I guess I have paddled sailed a bit more than you and regularly so in much stronger winds. I have never bent a mast or even come anywhere near it. You cannot paddle when rafted up so you slow down and the wind is exerting more force on the mast. Rafted up you cannot use the paddle or edging to steer (I guess the rudder does work when rafted up but of course you are only going downwind and as I said above the rudder's main limitation when paddle sailing is going upwind). 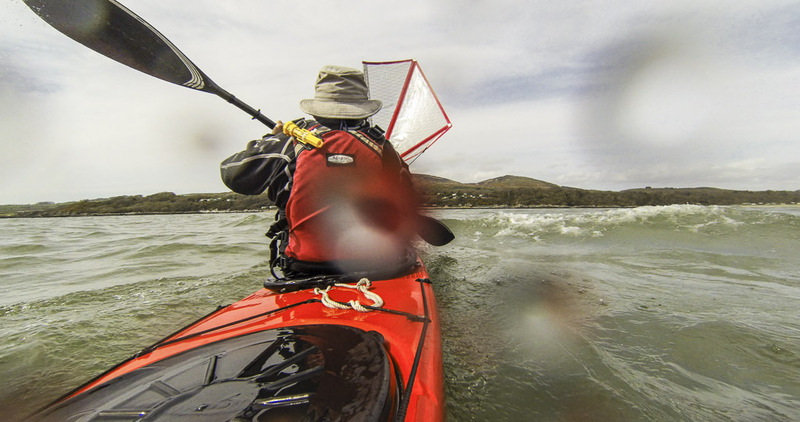 Steering with the paddle and edging are both essential kayak skills and it would be worth learning to control your kayaks with no rudder, what if the thing breaks in mid channel? The trick in strong wind down wind sailing is to paddle fast, use every wave to get on the plane. 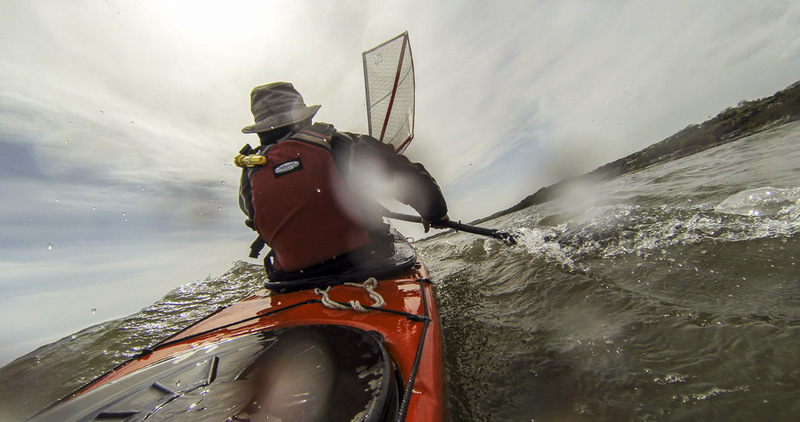 Increase your speed as much as possible and that reduces the apparent wind and force on the rig. Eddyline are great kayaks, I have enjoyed paddling a Fathom very much, I hope you enjoy them on many adventures. Please excuse the long answers but I think it is important for those thinking of taking up paddle sailing to realise that paddle skills and not rudders are essential to learning to paddle sail (as my example of my friend Tony (above) clearly illustrates). Best wishes, Douglas. Wayne Busby Come on then.....own up. Who mentioned rudders !!?? Alan Hunter Code 0,just fitted . not sure how I'll get on with it but fingers crossed , it certainly looks the part . These laminated fabrics hold their shape better but are not as durable as other materials. Alan Hunter To be honest I'm not sure which one mine is , it looks like yours Douglas but I'm guessing it's the previous material . Kari Tek delivered last week . 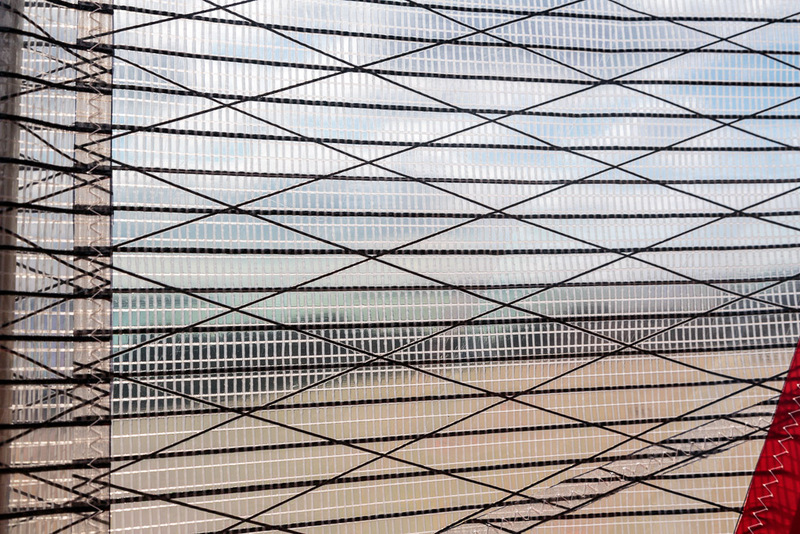 Douglas Wilcox Jimmy the new Trade Wind is mylar/carbon_kevlar scrim/mylar trilaminate. It's what they make windsurfing wave sails from so it's real tough. Jimmy Johnstone It is real tough until it delaminates. Douglas Wilcox Hi Jimmy I have a North trilaminate 5.0 wave sail that has seen 11 seasons hard use with absolutely no signs of delamination. As part of testing this particular laminate used by Flat Earth was left outdoors for all of this last Australian summer with no signs of UK damage. That's probably equivalent to several decades of Scottish summers! Douglas Wilcox It is non GORE-TEX drysuit trilaminate material I have had delamination problems with. Jimmy Johnstone UV damage I take it you mean. That is not what causes delamination so such static testing is not valid. The delamination in top end dinghy race sails ....identical material...comes from them being used. Flapping in wind. Put up and down. 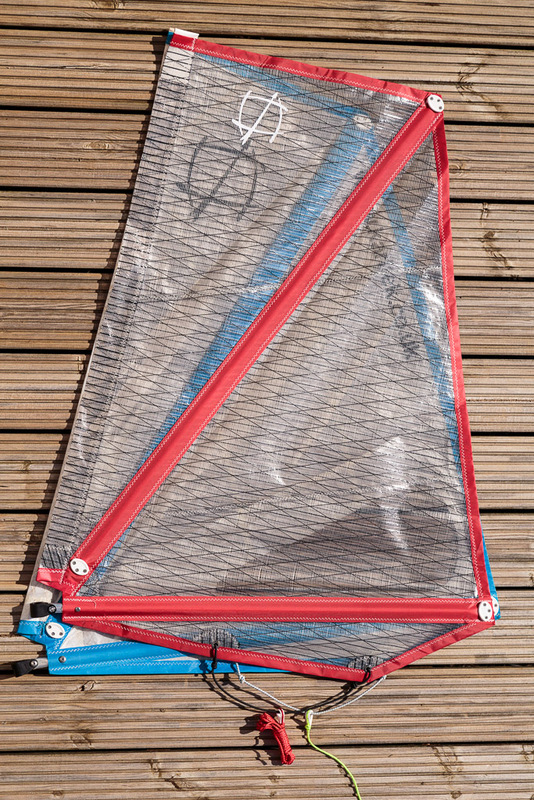 Fully battened sails such as windsurf ones give more protection to the cloth. These kayak sails are not battened. If used extensively over two years they will deteriorate. Jimmy Johnstone Not fully battened. One diagonal. The design looks good but I am not convinced on the choice of fabric. Time will tell. Douglas Wilcox Hi Jimmy I was not implying that UV damage caused delamination. When mylar monofilm was first introduced it did suffer from UV damage and became brittle a separate issue. The sails that were left outdoors in Australia were free to flap so it was a test of both UV stability and movement of the cloth. 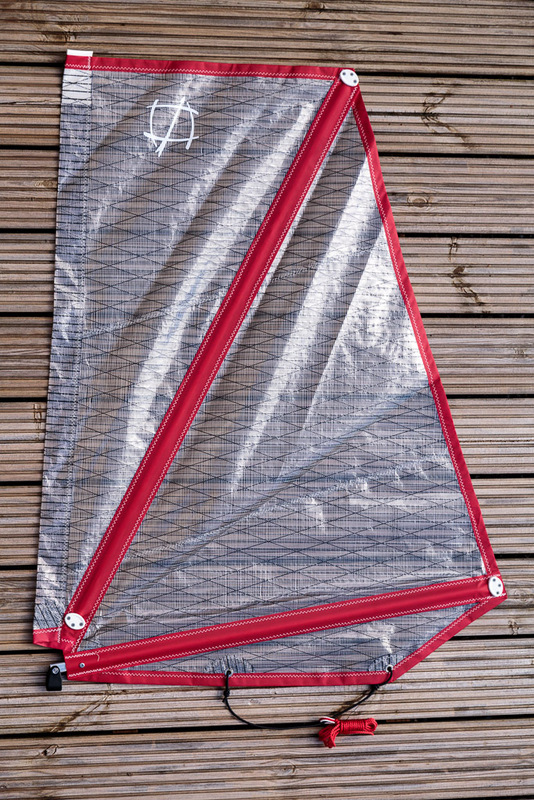 As you say time will tell, but the cost of one of these sails is relatively small, less than £200 so if used extensively over two years works out not very much per outing My current mylar/dacron bilaminate kakak sail has been used over 200 times and is still good with no signs of delamination.